AUTOMOTIVE NEWS: What do you need to do to be a legitimate competitor to BMW and Mercedes? DAN AKERSON: The segment of the luxury brand we need to be successful in is the small luxury segment, and that's the [Cadillac] ATS. 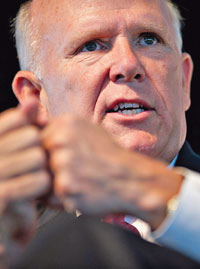 General Motors CEO Dan Akerson is steadily putting his stamp on the automaker. He is forging a cost-saving alliance with PSA/Peugeot-Citroen and is bullish about Opel's entry into new segments with the debuts of the Adam minicar and Mokka subcompact SUV. Akerson met recently at GM headquarters in Detroit with Automotive News Editorial Director Peter Brown, Industry Editor James B. Treece and Staff Reporter Mike Colias to talk about the company's future. How would you characterize the PSA/Peugeot-Citroen partnership so far? We've been in constructive dialogue for a long time. It's complicated because the uncertainty surrounding the European market specifically makes any move in this area one that has to be carefully considered. You want to advantage yourself, but at the same time you don't want to disadvantage yourself by making a strategic error. I think people were surprised and the analyst community was surprised in the third quarter when we were cash flow positive. That is not nearly good enough, so we have a long way to go, but there are green shoots in terms of what we're seeing. We're in new product segments that we were not in [before with] the Adam and the Mokka, which has over 50,000 orders. These aren't just wish list [orders]; these are good orders. The Adam has gotten rave reviews versus the Mini and the Fiat 500. We need to solidify our market position. We need to improve on our material costs. It's been extraordinarily insightful to share data with our friends at PSA. Before the end of the year, and it may slip over into the new year, we'll have more to say about our PSA relationship. Has your relationship with PSA saved you any money so far on material costs? What do you need to do to be a legitimate competitor against BMW and Mercedes-Benz? The segment of the luxury brand we need to be successful in is the small luxury segment, and that's the [Cadillac] ATS. We think the ATS is a very capable car on every level. That being said, it's a tough segment to break into, and even Lexus when they came out with their IS, they did OK, not great. ATS is not going to be introduced into China this year. It's going to be XTS, so it is a very cadenced effort not only in this North American market but also in China initially and maybe other markets over the next couple of years. Right now we have product in 80 percent of the luxury market. We weren't there before. I think not only the powertrains but the models we have in the small luxury and the kind of midluxury with the XTS and CTS will be refreshed in the third quarter, fourth quarter of next year. Then you'll have three good sedans, and you'll have an SUV in Escalade, so it's probably the best portfolio we've had in a generation. That doesn't mean we're going to stop there, either. We'll also add ELR at the end of next year. How about the BMW 7-series fighter that people have long talked about? What factors do you consider in whether to do a car like that? The progress we make in the marketplace and re-establishing the brand not only in North America but also China is one factor. The success that we have in brand building around the world is another. How well the XTS does -- does it have legs? Is it something that could run for six years, or is it a three-year horizon? We've got to make that decision, and we have a name for it inside the company as we study the possibilities. That decision has to be made within the next 12 months: whether we launch and have something toward the latter half of the decade. This is a big bet for us. What can we expect in infotainment? I remember 2 1/2 years ago, coming from a different industry, I thought that we were horribly underwhelming the opportunity, that the industry was, and it's got to change. It's got to radically change. I don't think anybody has gotten it right yet, but we have hired a number of people from the tech side of the world, both from the appliance side and from the network side, that I think will give us competitive advantage over the next two to three years. How do you ensure that you get the human-machine interface right? Believe me, this is not where we're going to stop, but, gee whiz, we're going to have Siri in our cars. We're coordinating with Apple. That is a step in the right direction. I think this company is blessed with so many good things, but if you would've brought somebody from Apple here five years ago, this whole industry would be radically different in this area of infotainment, and that's what we have quietly done. We've brought people in from Lucent and some of the carriers and said, "OK, clean sheet of paper, go." Where is all of this going? I made a comment when I first came here that every car ought to be a hot spot on the Internet, and it will be. It will be whether GM does it or whether Ford does it or if Volkswagen does it. It will come faster than people think. What's your ballpark time frame? You will see, in the next two to three years, radical changes. And GM will be in the forefront of that development.